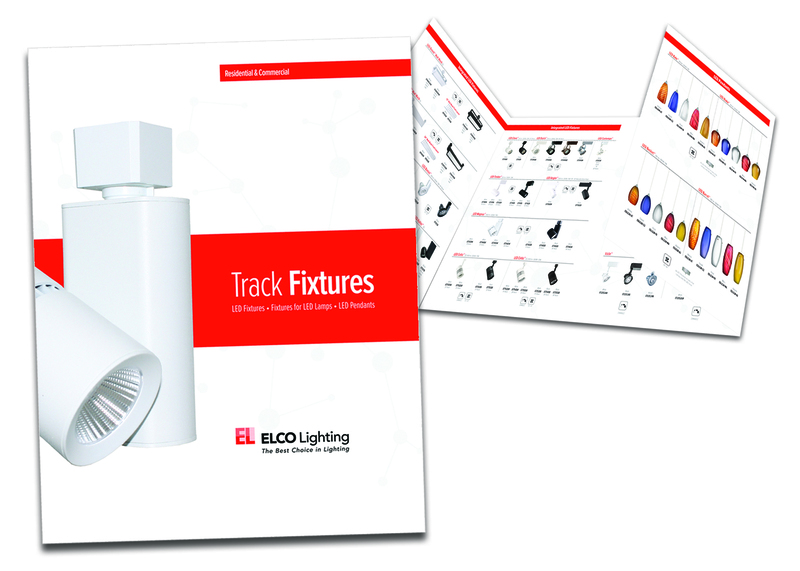 Elco Lighting, a national leader in lighting technology, is pleased to announce the publication of its new LED Track Fixture and Pendant Selection Guide for Residential, Retail & Commercial applications. This beautiful 8-page, full-color brochure features 15 Integrated LED track heads designs, 16 LED lamp-compatible track heads models and 4 beautiful LED pendant collections. Integrated LED Track Fixtures feature elegant design, maximum adjustability and lumen packages from 520lm to 2500lm. Most models feature die-cast construction for maximum durability. Some models offer beam spread, dimming and color temperature options making this collection amazingly versatile and useful in almost any indoor track application. The LED Angler model allows tool-free beam adjustments from 18°- 50°. LED Lamp Compatible models are available for 12V MR-16 and 12V GU-10 lamps. These popular Elco track heads are fully compatible with most manufacturer’s LED lamps (not included) and are a great way to realize the benefits of LED at an affordable price. Choose from beautiful finishes and 16 attractive cosmetic designs. Dimmability is dependent on lamp capabilities. All Elco Track fixtures have adjustable adapters to be used with 120V single or two-circuit “H-Style" track. Many can be adapted to J-Style or L-Style track. Consult factory in advance. Elco LED pendants come in 4 attractive shapes and feature double glass construction in 5 different color and pattern combinations. A lovely way to beautify or lend an air of intimacy to any hospitality, restaurant, retail or residential space. Each pendant includes a flat canopy in brushed nickel with an integral 5W LED driver and all hardware necessary to mount the pendant. “Elco has been working very hard to bring the best new products to our customers but without good literature the story of that effort would remain untold" said Michael Harris, Elco Sales Manager, “Our marketing and graphics team are dedicated to producing the best literature in the industry."